2018 New Pattern Lovely Personality. 18K Yellow Gold. Main Stone Shape. See picture. Main Stone Color see picture. Total Weight: 8.28 Grams. Ring Size: 8. Product Information Shape of Stones: Marquise. This Sterling Silver Ring is a perfect gift for a man. Handmade: Yes, Artisan Ring. Each ring will have different texture as you can see from photos. Product Type: Ring. 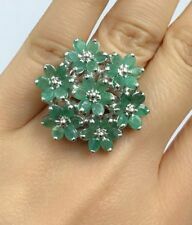 Ring Size: 5 US, 6 US, 7 US, 8 US, 9 US, 10 US, 11 US, 12 US, 13 US, 14 US, 15 US, 16 US. Pure 925 Sterling Silver Jewelry. No alloy, nothing. 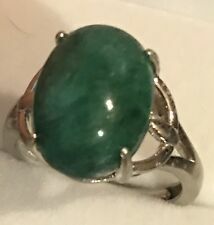 Gorgeous natural Zambian emerald cabochon cut big main stone about 10x13mm in Sterling silver adjustable size 6-8.75, cocktail ring, very unique! Ring Size: 7.75. Product Information Shape of Stones: Oval. Pave Diamond Bangle. Pave Diamond Jewelry. Pave Diamond Bead Ball. Polki Diamond Bangle. Diamond Wedding Bangle. Rose Cut Diamond Bead. Wide Cuff Bangle. Blue Sapphire Pave Diamond 18k White Gold Mother of Pearl Cocktail Ring. • Ring Size 7.5 - We Resize Rings for Free! 14k Solid Gold (Stamped). WHAT A BEAUTIFUL AND RARE, NATURAL, UNTREATED GEMSTONE! Set in a one-of-a-kind, handcrafted 18K Solid White Gold ring. Free professional ring sizing and free personal engraving! Clarity: VS, 100% TRANSPARENT, NO MAJOR CLACKS OR FRACTURES. BEAUTIFUL DRESS RING FOR A GENTLEMAN! Set in handcrafted 14K solid white gold ring. ONE OF A KIND, HANDCRAFTED RING. HANDMADE TO LAST FOR AN ETERNITY! HEIRLOOM PIECE! PRECIOUS JEWELRY TO BE PASSED ON! This ring takes PRESTIGE to a whole new level. Surrounded by 36 pieces of STUNNING & SPARKLING, natural diamonds. Set in a CUSTOM-DESIGNED, unisex, solidly handcrafted HEAVY 18K solid white gold ring. RARE PERFECT QUALITY. GLOWING SINGLE-SHADE GREEN COLOR, AMAZING DEPTH, AND EVERLASTING, UNIQUE COLOR! WITH 20 F/VS DIAMONDS! Perfect for a gentleman or a woman with a more masculine style! In 18K solid white gold ring. GREAT LUSTER AND CUT! RARE VIVID GREEN COLOR! ALL NATURAL! CLARITY GRADE IS ABOUT SI1, INCLUSIONS NOT NOTICEABLE WHEN WORN, BUT IT’S ALL NATURAL! The ring also contains 2 blue sapphires on each side, just to add a little but more color to this ring. 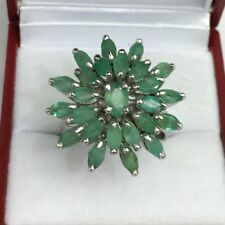 SPECTACULAR 8.95 CT. GREEN EMERALD OVAL STERLING 925 SILVER RING SZ 6.25 US. SPECTACULAR 8.95 CT. LUSTER : SPECTACULAR. FANCY SAPPHIRE ROUND DIAMOND CUT 1.0 MM.X 56 PCS. SHAPE : OVAL CUT & ROUND DIAMOND CUT. OTHER : YELLOW GOLD PLATED 925 SILVER RING. FACE RING 23 X 19 MM. 14k stamped. Total Weight: 4.31 grams. Ring Size: 7.75 (able to resize). NO MORE WORRY ABOUT THE RING SIDE. Shape of Stones: Oval. YELLOW GOLD PLATED 925 SILVER RING SZ 6.5. OTHER : WHITE SAPPHIRE ROUND DIAMOND CUT 1.2 MM. YELLOW GOLD PLATED 925 SILVER RING. SHAPE : PEAR CUT & ROUND DIAMOND CUT. COLOR : LIGHT GREEN & WHITE. FACE RING 21 X 16 MM. Pave Diamond Bangle. Polki Diamond Bangle. Diamond Wedding Bangle. Pave Diamond Bead Ball. Rose Cut Diamond Bead. Wide Cuff Bangle. Pave Diamond Jewelry. Diamond Palm Bracelet. SAPPHIRE 925 SILVER RING SZ 6.50. SHAPE : ASSCHER CUT& ROUND DIAMOND CUT. OTHER : FANCY SAPPHIRE ROUND DIAMOND CUT 1.2 TO 1.5 MM.X 44 PCS. FACE RING 21 X 12 MM. COLOR :GREEN. WEIGHT : WEIGHT OF SILVER 2.54 g. WEIGHT OF STONE 5.0 ct.
Marquise 2.3x4.8/2.5x5mm:44Pieces 7.95CT. Ring size 8.5- We Resize Rings For FREE! We Resize Rings For FREE! 14k Solid Gold (stamped). Gem Information. Pave Diamond Bangle. Polki Diamond Bangle. Diamond Wedding Bangle. Carved Gemstone Pendant. Rose Cut Diamond Bead. Pave Diamond Bead Ball. Designer Gemstone Earrings. Wide Cuff Bangle. 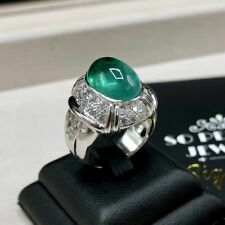 18K GOLD 8.30 CT GIA CERTIFIED GREEN COLOMBIAN EMERALD DIAMOND COLUMBIAN RING!! LIVELY FINE "VS" CLARITY - 1 INCH!! HIGH-END COUTURE! SAPPHIRE GEM 925 SILVER HEAD TIGER RING SZ 7.0. OTHER : BLUE SAPPHIRE ROUND DIAMOND CUT 1.7 MM. CHAMPAGNE SAPPHIRE ROUND DIAMOND CUT 1.5 TO 1.7 MM.X 91 PCS. FACE RING 24 X 12 MM. SHAPE : OVAL CUT & ROUND DIAMOND CUT. Traditional Claddagh Styling. The way that a Claddagh ring is worn on the hand is usually intended to convey the wearer's romantic availability or lack thereof. The ring is worn on the right hand with the heart facing outward to show that the wearer is not romantically linked but is looking for love. SHAPE : OVAL CUT. FACE RING 17 X 11 MM. COLOR :GREEN. WEIGHT : WEIGHT OF SILVER 2.44 g. WEIGHT OF STONE 5.70 ct. Best wishes to your and your family! We aim that all people around the world can be reached and perceive in our pieces through out an elegant and punctilious design from our professional team work. Joyaassilver Jewelry is Handmade Designer Jewelry. Joyaassilver Handmade Designer Jewelry ING-5947. Joyaassilver Team. Solid 9k Gold. UK Hallmarked. 9K UK Hallmarked Gold (375). All gemstones in this piece are natural and are crafted in solid 9K Gold. NO Synthetics! The beauty of the piece is its femininity and its proportions. Ring Size 7.5 - We Resize Rings for Free! 14k Solid Gold (Stamped). Round 3.8mm:19Pieces :5.70CT. Must Be in Original Condition! Joyaassilver Jewelry is Handmade Designer Jewelry. Joyaassilver Handmade Designer Jewelry ING-3001. Joyaassilver Team. Joyaassilver Jewelry is Handmade Designer Jewelry. In case you need any clarification or information about any of our products, pls. We shall get back to you within 24-48 hrs. Joyaassilver Handmade Designer Jewelry ING-85. 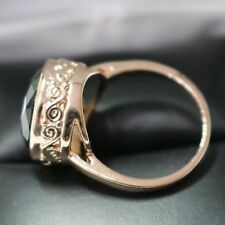 The ring has been designed in Victorian style. The ring has been designed in heavy setting with antique finish. This ring looks a class apart from others. Accents - Rose cut diamond accents. Weight of Gemstone - 5.00 Cts Approx. GEMS 925 SILVER RING SZ 6.75. HARDNESS : 7.5-8.0. SHAPE : OVAL CUT. FACE RING 17 X 12 MM. CLARITY : SI1. 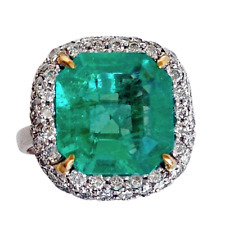 WEIGHT : WEIGHT OF SILVER 2.36 g. WEIGHT OF STONE 6.10 ct. COLOR :GREEN. Best wishes to your and your family! Solid 9k Hallmarked Gold. The piece is crafted in England in solid 9K gold. Using only natural mined gemstones. Resize Yes-Free. Free resize L-Q 1/2(UK), 6-8.5(US). Accent Gem Type Natural Pearl. The piece is shown on the long finger of the right hand. Joyaassilver Jewelry is Handmade Designer Jewelry. Joyaassilver Handmade Designer Jewelry ING-3237. Joyaassilver Team. Total Weight: 8.23 Grams. Ring Size: 6.5. Product Information Shape of Stones: Oval. 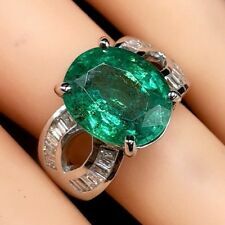 SPECTACULAR 7.5 CT. GREEN EMERALD OVAL CUT STERLING 925 SILVER RING SZ 9.25 US. SPECTACULAR 7.5 CT. OTHER : GREEN GARNET ROUND DIAMOND CUT 2.5 MM.X 6 PCS. LUSTER : SPECTACULAR. SHAPE : OVAL CUT & ROUND DIAMOND CUT. FACE RING 19 X 12 MM. RING SIZE : 9.25 (RESIZE : OK). COLOR : GREEN. Joyaassilver Handmade Designer Jewelry ING-4438. -Joyaassilver Jewelry is Handmade Designer Jewelry. Joyaassilver Team.